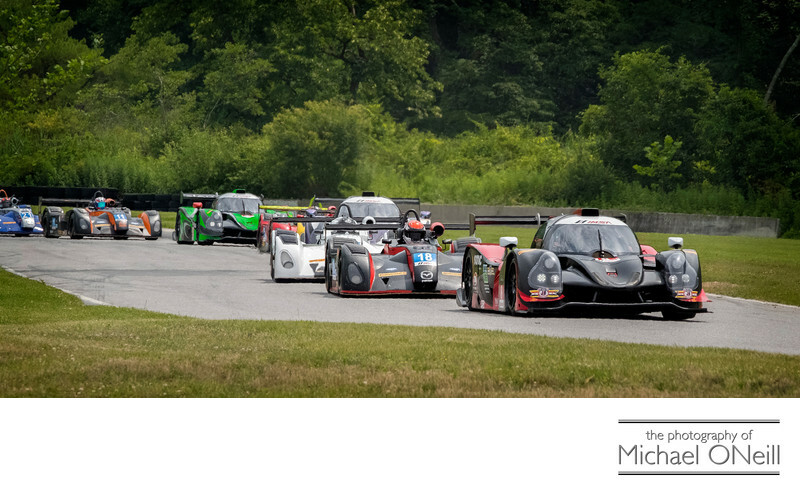 When you look at this picture of IMSA Prototype Class racing cars on the legendary road course at Lime Rock Park, try to envision this picture spanning two pages in a magazine…because that is exactly how it was ultimately used. When on an editorial assignment for a magazine (or internet based motorsports site) it is imperative for the photographer to have a good understanding of what the editor or art director has in mind for the photographs you create. Sure, you could go out and just shoot randomly, then piece together the shots in a layout after the fact but your better publications start designing their editorial’s appearance long before you pick up the camera. It is then up to the racing photographer to create shots to fit the layout…not the other way around. This is always the case in advertising photography. Advertisements are designed by the art directors of an ad agency and presented to the client for approval before they ever get to the point of commissioning the photographic art. Once approved and final comps are produced it is up to the advertising photographer to capture the exact shot that the art director has envisioned and the client has OK’d. You’ll find many different photographers on various "missions" at every speed contest. In the down time between the action we make small talk and discuss our particular objectives for the day. At one point or another I have found myself engaged in any one of the following activities. Most often my assignments are editorial in nature and I am given a lot of creative freedom to wander around the racing venue and capture images that I feel visually represents what the story is all about. This is one of the most exciting types of motorsports photography as I get to act truly creatively. Some of my assignments are for advertising and I think I covered that pretty well above. I am there to capture an exact image that will fit into an already designed advertising layout. Sometimes I am supporting a racing team or team sponsor’s public relations efforts. I am at the track to focus (no pun intended) on a single driver/car/team to capture whatever it is that they need. I have taken photos of racing machines on the track and portraits of drivers in their fire suits that have been used on promotional materials handed out to fans at the track. Some lucky fans get these pieces autographed by their racing heroes. Finally I some times go to the track just for myself…capturing images that I add to my library of stock photography or to test out a new piece of gear that I will use on a later assignment.